1963. 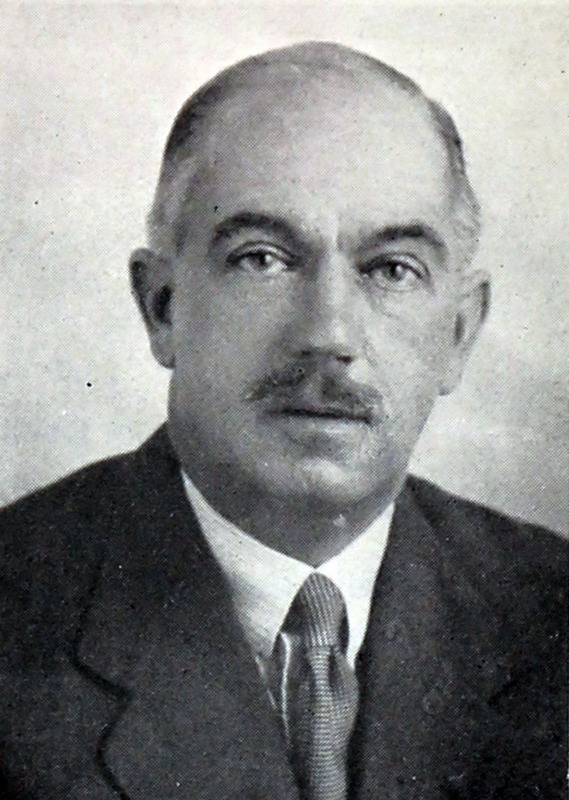 S. W. Fryer, director of Advance Motor Supplies. Advance Motor Manufacturing Co. Ltd of Northampton. The company produced Advance motorcycles, tricars and forecars. In addition they manufactured their own air and water-cooled engines, producing everything in-house with the exception of the cast cylinders. They were a pioneering company of the time and had a number of patents to their name for such things as their adjustable belt fastener. Advance also supplied engines to various leading edge projects such as Scott’s motorised sledges which went on trial in Norway, Handley Page’s Blue Bird monoplane and the Oakington monoplane built by Grose and Feary. 1902 The company was started in the latter part of 1902 by Douglas Herbert Gainsford and Frederick Smart, both from Northampton. Prior to that Gainsford and Smart were thought to have had a bicycle shop which hired out primitive motorcycles with wicker trailers. It was based in premises near Abington Square, Northampton. The company started to make a few motorcycles, but nothing really came of this for several years. Early in 1903 Joseph Charles Power of Watford joined Advance and together with Gainsford and Smart the design and manufacture of engines and motorcycle began. However in 1936 Advance placed an advert in Whipple's Directory which stated they were established in 1904. Their first engine was a 2.75 horse power single cylinder air cooled, with automatic inlet valve. This was built into a motorcycle from around 1903. The 2 3/4hp was soon replaced by the 3hp engine. The 3hp was in time joined by the enlarged 3 1/2hp and a 6hp V twin, of the same bore & stroke as the 3hp. All Advance engines of this time were of the same basic design, which included Automatic inlet valves and one piece cylinder head and barrel. The Advance engines were very reliable, so much so that they became very much in demand from other motorcycle manufacturers. The engines were also available by mail order from the factory. By 1906 Joseph Charles Power had moved from Watford to Northampton, to 16 Lorne Road. 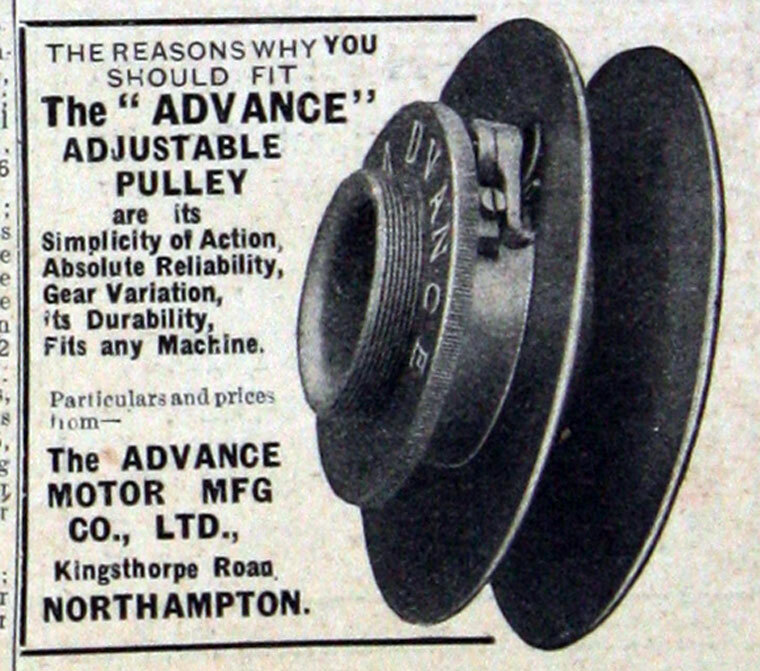 To aid the accent of steep hills the 'Advance Adjustable Pulley' was invented and patented in 1907. In the same year Advance's sales catalogue displays 3, 3 1/2 & 6 horsepower motorcycles and a ladies version of 3 hp. In addition they made a 6hp forecar and 6 & 9 hp tricars, all of which were available with air or water cooled engines. 1906 Late that year they listed a machine that had a lower frame-line than was usual for the era. It had a single V-twin engine, belt drive and sprung forks. The engines ranged from 3hp singles to 6hp twins. The low-stung frames became their distinguishing feature. 1907 The Zenith Gradua Gear was manufactured by Advance, this stayed in production from 1907 until 1923. Advance also produced most of the engines for Duzmo Motorcycles of Enfield, from 1919 to 1923. As well as supplying the motorcycle industry, Advance also supplied stationary engines for driving agricultural machinery. 1908 Advance started to appear in The Motorcycle as motorcycle manufacturers. The same line up of motorcycles and three wheelers were listed, however the 9hp motorcycle was now available with an air-cooled engine. 1910 They were trading from Louise Road, Northampton, where they manufactured engines, motorcycles and tri-cars. Their range included single cylinder motorcycles of 3hp and 3.5hp and also a 6hp V-twin. 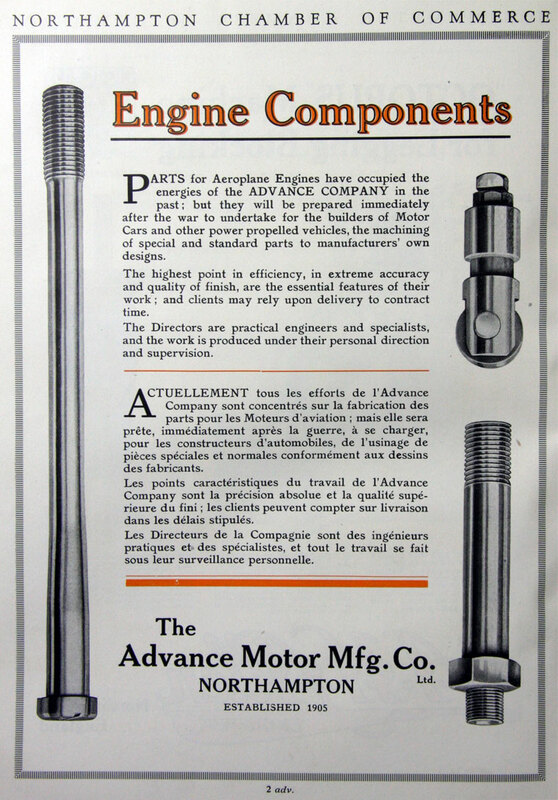 Advance also made 6hp air-cooled V-twin and 9hp water-cooled V-twin tri-cars. 1912 the firm moved to larger premises on the corner of Kingsthorpe Road and Balmoral Roads. It was about this time that motorcycle and tricar production ended. It seems that Advance's efforts were channelled into reconditioning engines and the manufacture of the necessary components. A sister company to Advance was incorporated in 1916, Standard Valves Ltd manufactured replacement valves for the motor trade. 1924 By then they had moved to Kingsthorpe Road, Northampton. 1936 Whipple's Directory of 1936 features an advert by Advance. It states they were Contractors to the War Office, Admiralty & Air ministry. Engineers Specialist Cylinder re-grinding, repairs and replacements, case hardening and grinding. Early 1950s Advance was sold to Sheepbridge Engineering of Chesterfield, who were well known for their thin liners for engines. Around this time they were renamed as Advance Motor Supplies Ltd.
1979 GKN purchased Sheepbridge including Advance. 1982 the company changed its name to GKN Replacement Services Ltd.
By 1984 their name had changed again to GKN Autoparts Distribution Ltd.
1989 Another name change occurred on 25th Sept 1989 this to to Autoparts Distribution Ltd.
On 1st October 1995 became Partco AutoParts Ltd.
As well as producing their own products, Advance were district agents for Kerry Cars and dealers for Brown and Barlow carburettors. Advance also had a sister company, Standard Valves which specialised in manufacturing and supplying valves to the motor industry. Advance shared both their sites in Northampton with a company called Standard Valves. SV were dissolved in 1977. This page was last edited on 28 November 2018, at 18:21.